Blueberry season is finally upon us here in West Virginia. Last week I made it out to a local farm’s blueberry patch on their opening day. I’ve gone berry picking almost every summer of my life, but I believe this was the first time I’ve ever been out on an opening day, and it was glorious. The bushes were heavy with blueberries, and in no time at all, I was able to pick two buckets full of the most plump, sweet berries you could imagine. When I was finishing up the first bucket, I thought that this might have been the first time I could have possibly out-paced Gram at picking. Then I smiled, because that was based on nothing but wishful thinking. Gram was the one who first took me blueberry picking when I was just a little girl and never once had I picked more berries than her, even when I joined her as an adult. Maybe she was more patient, staying at one bush while I wandered around from place to place, looking for the best berries. Maybe she daydreamed less while I would think about this boy that I liked or that story I was going to write. Maybe she just didn’t eat as many berries as I did (and still do!) when out in the patch. This has been a year of one loss after another. Mom, Gram, Elliott. Sometimes I can’t even tell who I’m grieving. Out among the berries, I naturally thought about Gram, because this was the place where I felt the most connected to her. But I missed Mom as well. The first time I made blueberry jam, I was on the phone with her constantly because I knew that she had done it before and I wanted her long-distance reassurance that I wasn’t screwing it up. And I missed Elliott, thinking about how I had been looking forward to taking him into the fields with me and his brothers and sisters, passing on this tradition of putting our hands on the food we would later enjoy. There is often talk of waiting when people speak of the dead. Of how we’re waiting to see our loved ones again. Of how they’re waiting to greet us in Heaven. I’m not sure what I think about the afterlife. I have a lot of questions about what I’ve been taught about heaven and hell, and as a result, I don’t find a lot of comfort in talk about what people who have died are doing now that they’re no longer with us. My uncertainty makes me uneasy. I believe that there is something more than this life, but the not knowing makes it difficult for me to dwell on it. It means that I don’t find comfort in waiting. But regardless of what I believe or not, there is a kind of waiting that happens when some are gone and some remain. Almost daily I am reminded of the separation that has happened, and in that moment, I am waiting. Sometimes with expectation, often without, but I am forced into the position of waiting. Blueberry season is short – just a few weeks. Soon I will be waiting for next July. But while the blueberries are in season, I will enjoy them. I will make every recipe I can find or just eat a handful right from the bush. I will appreciate their beauty and savor their flavor. I will fully experience this season. Our time here is short as well. Whether it’s the few months that my son had or the 80-plus years that my grandmother had, we are only here for a moment. So while I wait, I will cherish memories of those I’ve lost, and I will make memories with those who are here. I will take my children to pick blueberries and tell them stories about my childhood and things that I remember about my grandmother. I will make blueberry jam and give some away to people at work and tell them about my mom’s writing about the raspberries that she grew in her back yard. I will bake a blueberry cake with Rich and we will remember how he could calm Elliott with his voice when our son was inside me. I will wait, but while I wait, I will fully live. 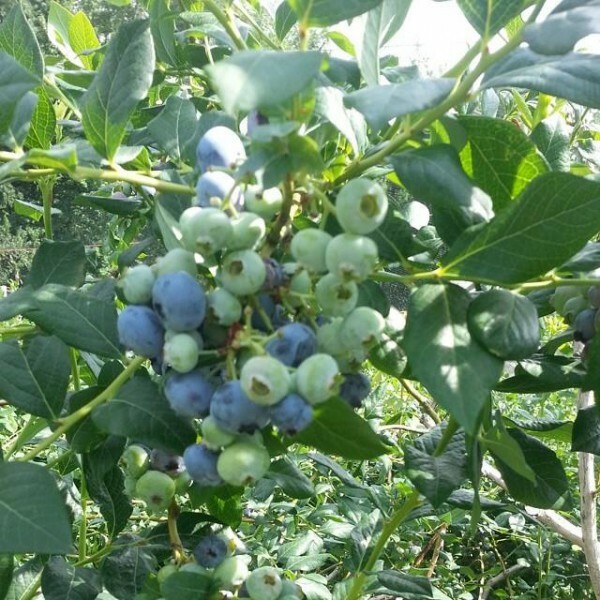 This entry was posted in Grief and tagged blueberry picking, death, stillbirth. Bookmark the permalink. Yes, I understand that discomfort of how to reconcile the idea of heaven. For a long long time, I never talked about my dad’s death in front of the kids. My eldest was only 9 months old when it happened. And just this year I made the conscious decision to refer to him as “Grandpa” in front of the kids, instead of “my dad”. But on my present journey, I’m struck by some ancient ways of dealing with death. At my partner’s aunt’s memorial last year, her brother said something that I’ve been mulling over and over. He spoke of energies going back into the world to strengthen loved ones left behind. I can’t say that it is completely incompatible with my faith. And in some ways, it’s far nicer to believe our loved ones are already with us in some senses. Love you, my friend. I think your methods are good ones. Absolutely beautiful, Alise. It’s amazing what tactile things and simple activity can do for us while we’re grieving, while we’re waiting. Simply beautiful!!! Although sometimes it seems really hard to on with our life while grieving, it also helps us cherish the little things a bit more.